Hit the Gellong Football Club Website to share the excitement of ‘The Cats’ fantastic win in the 2011 Grand Final. We are Geelong….the greatest team of all! Please leave your comment about the boys who play for Geelong. Why do you think Geelong play so well as a team? Flight Day- Around Australia in a Day. Flight Day was the day we all pretended to to take a trip around Australia. The teachers dressed up as the flight attendants, security officers and cabin crew. We even had Jack, the customs dog who sniffed for illegal substances. It was the passengers’ responsibility to come to school ready for the airport experience. Students required a boarding pass, passport and their luggage. The security checks were just like the real airport- an X ray machine for carry on luggage, Mr Arundell who scanned for suspicious things inside passengers’ pockets and finally the metal detector. The flight attendants welcomed us abourd Flight 747 and the seats were arranged behind the business class seats. Business class were lucky to sit on very comfortable chairs while all other passengers sat on coloured paper on the floor! The In Flight hospitality was delicious, especially the chocolate coated Teddy Bear biscuits for Business Class passengers. The emergency procedure was on the big screen and was a funny video but all the words were like the real script. Captain Quirk loved flying to every state of Australia and stopping over at all the capital cities. We learnt so much from our exciting day and our narratives about ‘The Day the Hall Took Off’ will be our next post this week. Please enjoy our slide show and video. Don’t forget that all viewers should leave an interesting comment about our Flight Day post. On Wednesday, August 17th, The Middles travelled to Geelong to visit The Ford Discovery Centre. While we were there we took the opportunity to walk to Eastern Beach checking for rabbits on all the bollards along the way. We enjoyed our ride on The Carousel which is in the beautiful Pavillion at The Waterfront. The Poppykettle Fountain is near Cunningham Pier. The story of The Hairy Peruvians trip across the Pacific Ocean is called The Voyage of the Poppykettle by Robert Ingpen. Please enjoy our Slide Show. What part of our day in Geelong did you enjoy the most? Congratulations to Jayvee, Thomas, Tyler, Mitchell, Adam and Prince who performed in front of the whole school at assembly this week. They were fanstastic and everyone says that they should go on Australia’s Got Talent. Their next performance will be at camp! If you are wondering why everyone looks like they are dressed in their pyjamas, it is because they were in the PJs! The JSC raised $500 for their charity today. Even Mr Creece got dressed up in his PJs-but he forgot to do his hair! Leave a comment for the dancers to enjoy. They tried very hard to entertain you with their performance. Middles Assembly Dance from Bernadette Lynch on Vimeo. What a funny start to the day we had…. When we arrived back from lining up, we discovered a very scared wattle bird had lost its way and became caged in our classroom. The bird was frantic and was flying around the classroom bouncing off the windows. We were distressed because it was difficult to show the bird a path to freedom. We opened as many windows as we could but the old ‘ballroom’ has been shifted so many times over the years that the windows don’t open very well any more. Mr Wood came to our rescue. He released the pin board where the bird had become captured between the window and the big display board. It flew straight out the door and up into the wide open blue sky. We were so relieved that our story had a happy ending. Thnak you Mr Wood. 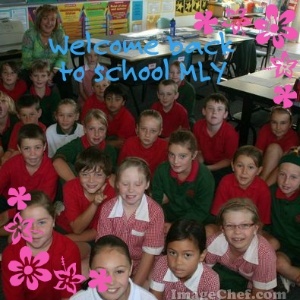 Please leave a comment about your first day back at school for Term 3. Try to write an interesting comment for others to read. Leaving interesting comments is our focus for this term. Be careful to check spelling, punctuation and grammar. This week we will be conducting our parent/teacher interviews. The Middle Department include the students in the interview process because we believe that the students own their learning so they should be involved. We will conduct our 3 way interviews on Thursday. We have a script to follow. Here is the script for you to practise at home. 1. Student enters the classroom and greets the teacher formally. 2. He/She introduces the parents to the teacher (first names). Could you please tell my parents about my achievements so far this year? Could you please tell my parents about my learning improvement goals for the rest of the year? Could you tell my parents about my organisation, confidence, persistence, getting along behaviour, and resilience? Could you tell my teacher about my home reading, homework, projects and organisation skills? Could you tell my parents about my behaviour in class? What achievements you most proud of so far this year? What goals would you like to achieve before the end of the year? We attempted a funny one at school so that everyone knows what to expect. Thankyou Zoe, Adam and Charlotte for joining in with the fun. How many hours of sunlight did we have? Have many hours of darkness did we have? This is called the Winter Solstice. Now that we have had the shortest day the daylight hours will gradually grow longer and we will enjoy the summer season again. Hooray for Summer! What are 5 positive things about the winter season? Our unit this term is ‘Work, Rest and Play’. We have attempted to learn about timelines. We studied traditional ways for… ‘how man has spent his recreation time throughout history’. This is a tricky concept for Gr 3/4. We decided that one of man’s earliest hobbies way back in ‘Stone Age’ times- star gazing. Since then our class has started to notice that this simple recreational activity can be AMAZING. We have two posts this year:The Big Moon and Four Planets in a Line. We enjoyed learning about the stars and the moon. This video explains what happened last night. It was the longest eclipse for hundreds of years. Leave a comment and tell us if this is an interesting pasttime for kids these days. I’ll read your comments to Harry! Our Literacy block is crammed with reading and writing. We are always busy with the Daily 5- read to self, work on writing, read to someone, listen to reading, word work. Our focus this term is on the Shared Book part of our reading session. This is when we gather together to read from the same text. We learn how to read. We observe the punctuation sign posts, we change our voice to add expression and interest to what we read and we enjoy the text together. Mrs Lynch has her new special book to write a learning focus for each lesson. Please watch the videos and you will see that everyone in the class receives encouragement in this part of our reading block. Untitled from Bernadette Lynch on Vimeo. What do you like about doing our Shared Reading together? Ms Richards came to our class to help us use codes to highlight some strategies that help us in understanding a text. We used- making connections, a question, a new word and main idea. Please leave a comment about Ms Richard’s Shared Book session.